This scene of Broadway, looking west from Oak Street in 1941, is perfectly ordinary. Shops line Broadway—among them, Sterns Electric Equipment Co., Mutual Home Equipment Co., Syracuse Wallpaper & Print Co., John E. Smith & Son butcher supplies, tailor Frederick Pollock, and Henry Haber’s men’s clothing. Visible at the center of the image are the offices and printing works of the Buffalo Volksfreund, a local German-language newspaper that will continue to be published until 1982. 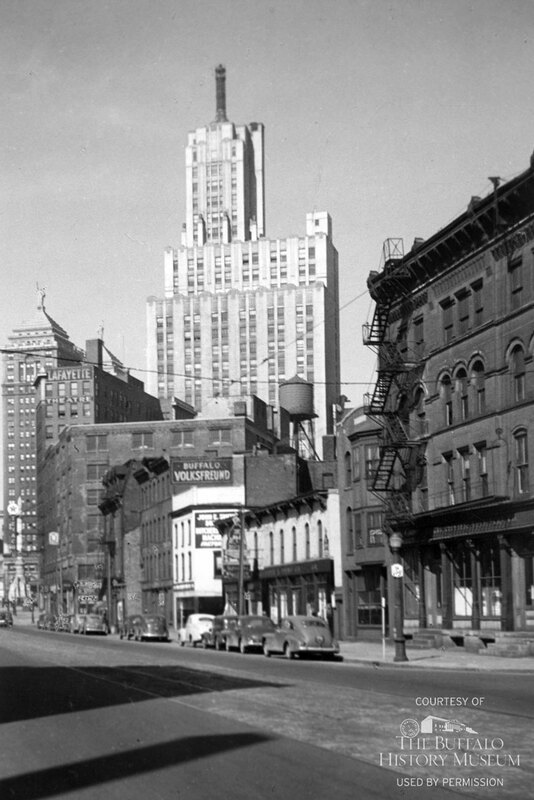 In the background, the Rand Building’s neon beacon rises 391 feet above Lafayette Square. Also in the background is the 3,238-seat Lafayette Theatre, which will be closed and demolished for parking in 1962. In the foreground are the tracks of the Broadway streetcar line, which will remain active until 1950. In 1941, nothing was ordinary across the Atlantic and the Pacific. On December 7, Japan will attack Pearl Harbor in a surprise military strike.